How many times have you heard of a hobbyist killing their entire collection of fish because they forgot to shut off the incoming city water supply? Unfortunately, we hear sad stories and find its way too common! But there is a very cost effective product that will prevent that from ever happening again. 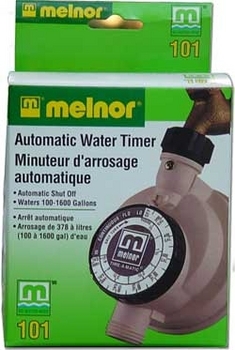 The Melnor Automatic Water Timer goes between your water faucet and your garden hose. Or it can be installed anywhere in your incoming hard plumbed water supply. It will meter any amount of incoming water between 100 to 1600 gallons. Simply set the desired amount of water needed and this unit will automatically shut off the water supply when the amount set is reached. It even has a "continuous flo" setting for times when you want to water the yard. Helpful Hint: Do you have trouble calculating the number of gallons of water in a odd-shaped pond? Simply use the Melnor Automatic Water Timer and record the flow.